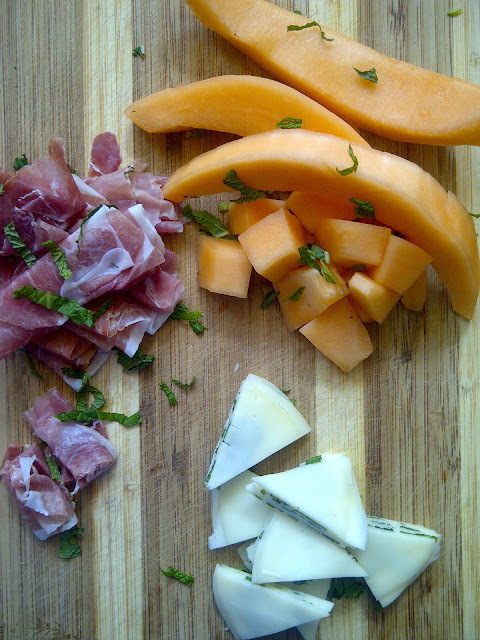 Prosciutto with melon is just divine, and it is so simple. The sweet, juicy cantaloupe, the savory, salty cured ham - which itself lends a certain sweetness - both together will create a party on your palate! This combo has been around for years, it is the O.G. of sweet and salty (O.G. = Original Gangsta, just in case...I figured I'd save you a Google search). Now lets add some herbed provolone, shall we? The inspiration for this plate came from our flight home from Hawaii. Edmonton to Honolulu has got to be the LONGEST flight I've ever taken. So when we grossly underspent our travel funds, an upgrade to first class, on our red eye flight home, was a no brainer! I have NEVER flown first class - I don't get out much, period. What a difference, OMG. Complimentary non-stop beverage service, video players, luncheon plate, coffee and dessert. Sadly, this will probably have been my only jaunt in first class (tear). On this luxury flight home a small plate of proscuitto and provolone was served, along side a melon and fresh herb salad, nestled in a cupped leaf of radicchio. I guess it kind of made an impression upon me, so thank you Alaska Airlines, thank you. The prosciutto is Prosciutto Di Parma, again from the Italian Center in Edmonton (as was the feta in my last post). We bought 8oz for about $11, and only used about half of it for this plate (for two servings). So a little of the good stuff will go a long way. If you are a veg-a-materian, you can skip the ham, but DO opt for a nice sharp, smells-kinda-like-feet, provolone - it is packed with flavor. To give it a little kick, I simply layered some mint chiffonade between stacked slices, then cut the cheesy, minty layers into wedges. S was skeptical at first......and then he tried it, and hasn't stopped talking about it since. Seriously, it was that good. My original intention was to use basil, but my basil wasn't looking so hot. Good thing I had some mint for a back up plan - it was da bomb! I chose cantaloupe, but any other melon, or pineapple would work, in my opinion. Your looking for a nice sweet contrast against the salty, savory ham and cheese. The cantaloupe alone with the mint was a treat in itself, as we had leftover melon. 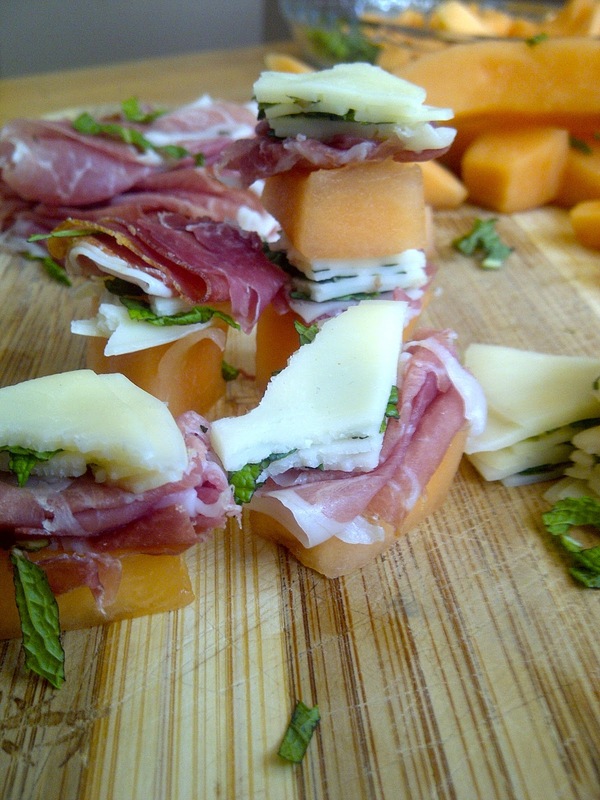 Whether you decide to wrap your prosciutto around melon wedges, or stack smaller pieces, as shown above, please consider the herbed cheese as an accoutrement, you won't be sorry!! To prepare the herbed cheese, stack 4 slices of cheese together. Peel each slice back and thinly spread sliced mint between layer. Press down, firm with hand, to seal. Slice each layered stack into 8 wedges. Repeat three more times with remaining cheese and mint. You will have a little left over mint - set aside to use as a garnish. 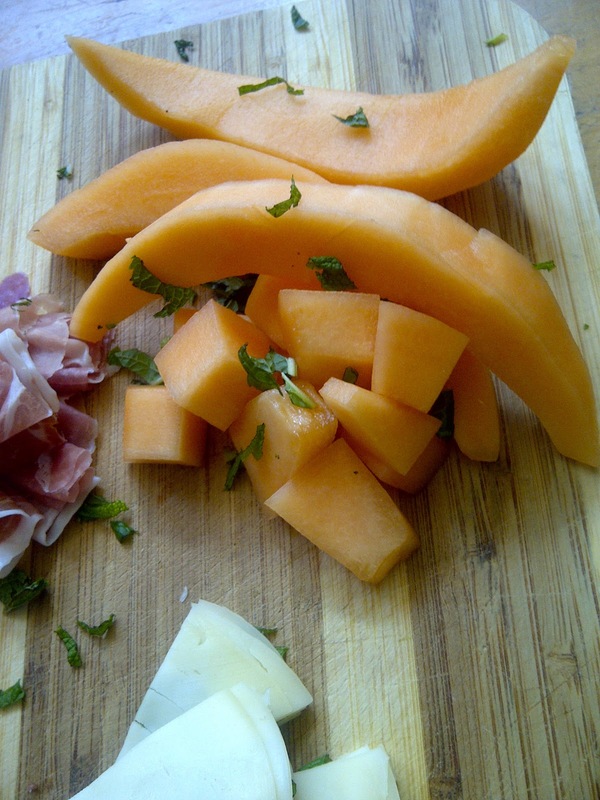 Slice or chop the cantaloupe into desired size. 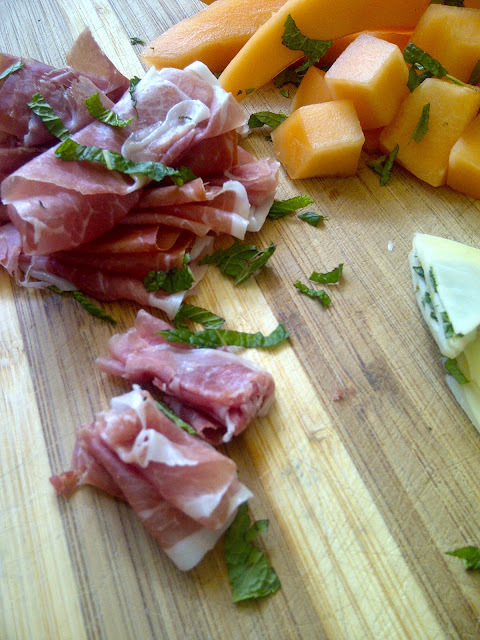 Loosely roll the prosciutto, then slice into thirds. Arrange onto serving platter, sprinkle with remaining mint. Chill until ready to serve. Looks so delicious Kim! Thanks for sharing on Creative Monday. A blueberry-free post!! Thanks for stopping by!! Thanks, Claire & please do! 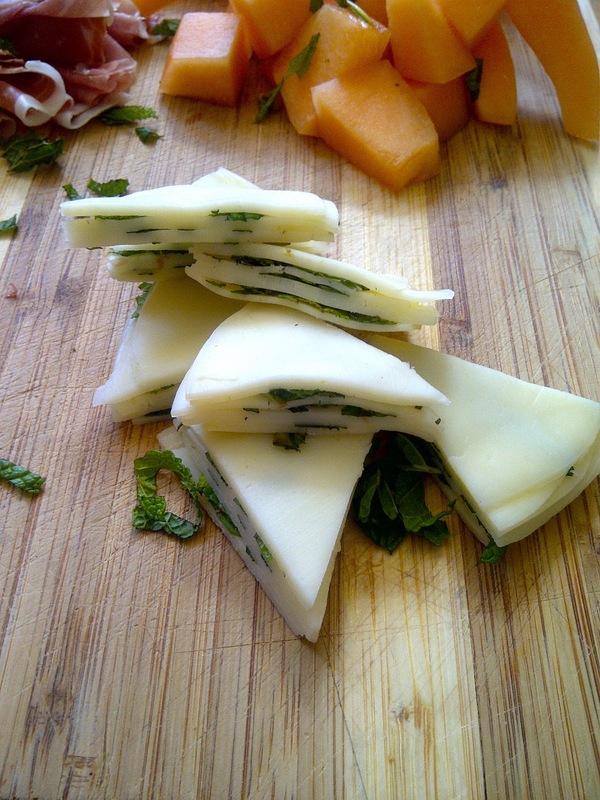 LOVE the idea of stacking herbs between a softer cheese and slicing! Genius. This opens up a new world of possibilities for the next cheese plate I assemble, which must be soon. It was a crazy, hair-brained scheme, it just happen to work (this time, not all the time though). Sing it, "A Whole Neeeeeew Wwwwwwworld!!!!" WOW! Pinned! Must try this!! wonderful eye appeal, knock out with the mint layered in the cheese. You have given me some wonderful yummy ideas! Btw, I have never heard of anyone underspending on vacation! Good for you to treat yourselves to an upgrade for the long flight home! 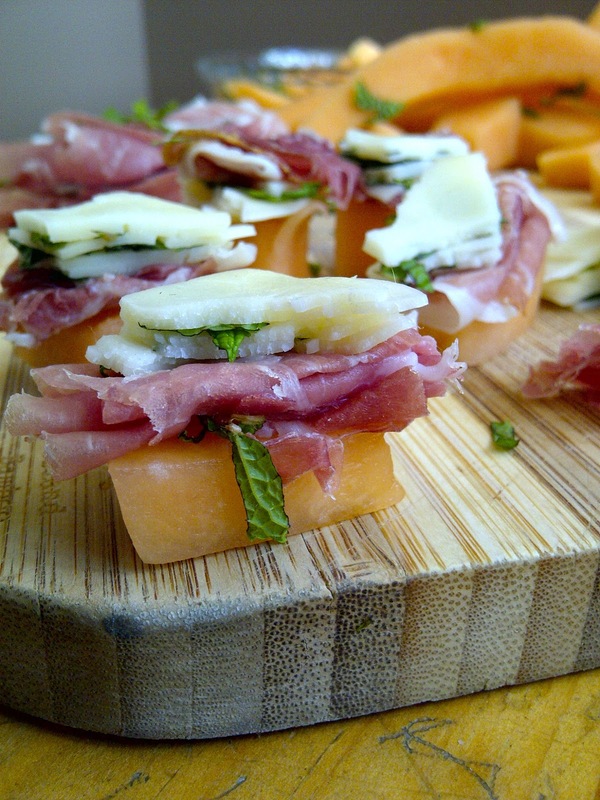 Mmmmm...have had prosciutto and melon, but not the herbed provolone! Will definitely have to try this. I'm visiting from Pint Sized Baker. If the mint freaks you out, try basil instead :) Thanks for stopping by!! Thanks Linda, I appreciate it!! I could totally devour a few of these bites! Thanks for linking up to What's Cookin' Wednesday! Oh my goodness! I've never eaten cantaloupe with anything, just plain. This looks brilliant and so flavorful. Ohhh maaaan, my mouth is watering! This looks and sounds amazing! Never would have put these together, but it sounds awesome! Thanks Lorraine! You must try it, the hubs is already asking for it again (so you know it must be good). I love that you pressed the mint in between the cheese. Great idea. I'll be featuring this recipe on Thursdays Treasures. this look sooo yummy, kim!! pinning now and featuring you tonight! This would be a great appetizer for a summer party! Delicious! Thanks for sharing at Sweet & Savory Saturdays #14. A tasty salty but sweet classic! :) Love it! Very interesting to add the provolone, I think! Thank you so much for linking up with me this week at Tasty Tuesdays! I’ve pinned this & shared it with my followers! Please be sure to stop back by the party and check out some of the other links!